In the DMVPN Overview article We explained how DMVPN combines a number of technologies that give it its flexibility, low administrative overhead and ease of configuration. This article will cover the DMVPN Configuration including Hub, Spokes, Routing and Protecting the mGRE Tunnel. 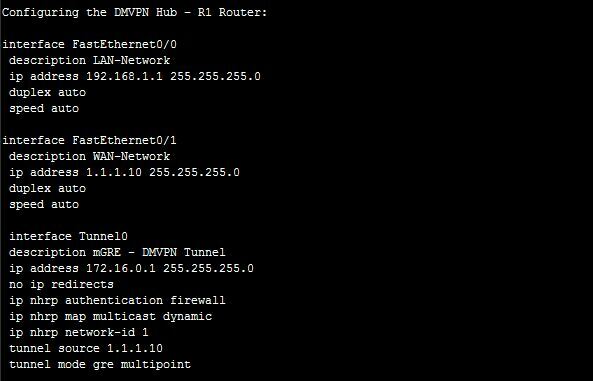 DMVPN Configuration is simple, if you’ve worked with GRE tunnels before. If the GRE Tunnel concept is new to you, we would recommend reading through our Point-to-Point GRE IPSec Tunnel Configuration article before proceeding with DMVPN configuration. DMVPN as a design concept is essentially the configuration combination of protected GRE Tunnel and Next Hop Routing Protocol (NHRP). This article examines a specific DMVPN deployment architecture. Those seeking additional information on available DMVPN deplyment models can also visit my Dynamic Multipoint VPN DMVPN Architecture article. Each spoke has a permanent IPSec tunnel to the hub but not to the other spokes within the network. Each spoke registers as a client of the NHRP server. The Hub router undertakes the role of the NHRP server. When a spoke needs to send a packet to a destination (private) subnet on another spoke, it queries the NHRP server for the real (outside) address of the destination (target) spoke. After the originating spoke learns the peer address of the target spoke, it can initiate a dynamic IPSec tunnel to the target spoke. The spoke-to-spoke tunnel is built over the multipoint GRE (mGRE) interface. The spoke-to-spoke links are established on demand whenever there is traffic between the spokes. Thereafter, packets are able to bypass the hub and use the spoke-to-spoke tunnel. The diagram below depicts our DMVPN example network. Our goal is to connect the two remote networks (Remote 1 & 2) with the company headquarters. The headquarters router R1 is the central Hub router that will hold the NHRP database containing all spoke routers, their public IP addresses and LAN networks. Engineers familiar with GRE Tunnels will immediately notice the absence of the tunnel destination command. It has been replaced with the tunnel mode gre multipoint command, which designates this tunnel as a multipoint GRE tunnel. The ip nhrp map multicast dynamic command enables the forwarding of multicast traffic across the tunnel to dynamic spokes. This is usually required by routing protocols such as OSPF and EIGRP. In most cases, DMVPN is accompanied by a routing protocol to send and receive dynamic updates about the private networks. The ip nhrp network-id 1 command is used to identify this DMVPN cloud. All routers participating in this DMVPN cloud must have the same network-id configured in order for tunnels to form between them. The ip nhrp authentication command is used to allow the authenticated updates and queries to the NHRP Database, ensuring unwanted queries are not provided with any information about the DMVPN network. The ip nhrp nhs 172.16.0.1 command tells our spoke router who the Next Hop Server (NHS) is, while the ip nhrp map 172.16.0.1 1.1.1.10 command maps the NHS address (172.16.0.1) to the Hub’s (R1) public IP address (1.1.1.10). The ip nhrp map multicast 1.1.1.10 ensures multicast traffic is sent only from spokes to the hub and not from spoke to spoke. All multicast traffic should be received by the hub, processed and then updates are sent out to the spokes. Lastly, notice that tunnel source FastEthernet0/1 command. All spokes with dynamic WAN IP address must be configured to bind the physical WAN interface as the tunnel source. This way, when the spoke’s WAN IP changes, it will be able to update the NHS server with its new WAN IP address. Note: In R2’s configuration, we’ve configured a static IP address on its WAN interface FastEthernet0/1, but for the sake of this example, let us assume it was dynamically provided by the ISP. Note: In R3’s configuration, we’ve configured a static IP address on its WAN interface FastEthernet0/1, but for the sake of this example, let us assume it was dynamically provided by the ISP. This completes the DMVPN configuration on our central hub and two spoke routers. It is now time to verify the DMVPNs are working correctly. After completing our routers configuration, it’s time to verify everything is working as planned. The output of our command provides us with some valuable information. To start with, the router provides an explanation for each column presented (right under the show command) but we are still going to cover them so that we are not left with any unanswered questions. The first column #Ent shows the number of entries that exist in the NHRP Database for the same spoke. Usually, we wouldn’t expect to see more than one for each spoke. The second column Peer NBMA Addr presents the spoke’s public IP address, while the third column, Peer Tunnel Add, shows each spoke’s local Tunnel’s IP address. Next, the State column shows the current state the tunnel is in. In our case, both tunnels are UP. Right next to the State is the UpDN Tm, which is the Up or Down Time of the current State. This is a very important bit of information as you can clearly see out how long your tunnel has been in its current state. For our example, both spokes have been up for almost 5 minutes. Lastly, the Attrib column shows the type of tunnels established by the spokes. D stands for Dynamic, S for Static and I for Incomplete. Usually dynamic spokes will create D type tunnels. Tunnels established from the spokes to the Hub router are expected to be S type, since the Hub remains static. Since we have our GRE tunnels up and running, we need to encrypt them using IPSec to ensure data confidentiality. so we are going to simply display the commands here without repeating the topic. Notice the command crypto isakmp key Key_name address 0.0.0.0 0.0.0.0. The peer address for which the isakmp key is valid is 0.0.0.0 0.0.0.0, which means every possible host on the Internet. When our remote routers (spokes) have dynamic IP addresses, 0.0.0.0 0.0.0.0 must be used. Again we’ve defined 0.0.0.0 0.0.0.0 as the isakmp peer address. While the hub’s public IP address is known we must keep in mind that R2 and R3 can build dynamic VPN tunnel between them. Taking into consideration that their public IP address is dynamic it is imperative to use 0.0.0.0 0.0.0.0 for the remote peer. Last step involves enabling routing in our DMVPN network. This is required so that the hub and spoke routers are aware which packets need to be sent via the VPN network. For the sake of simplicity we are going to focus on static routes. DMVPN Configuration and routing protocol configuration will be covered in another article. Configuring the necessary static routes is very simple. All that is required is a set of simply static routes on each router (hub and spoke), pointing to the other networks. Our DMVPN Network is Ready! At this point, our DMVPN network is ready and fully functional. All networks are connected between each other and dynamic VPN tunnels between spokes can be established. GRE tunnels are protected properly, providing data confidentiality and ip routing is enabled. It is evident that the two spoke routers have established communication. This concludes our DMVPN configuration article.